Plunge into the heart of Tuscany with this unforgettable Pienza and Montalcino tour. 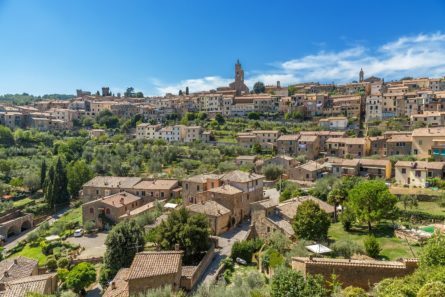 Depart from Siena or Florence in the morning for Montalcino, capital of the legendary Brunello wine region. After exploring this quaint medieval town, head out to see the Sant’Antimo Abbey, a celebrated milestone of the ancient pilgrim path between Canterbury and Rome. Next up is a special wine tasting of award-winning Brunello wines at a family-owned winery, known only to locals, followed by a traditional Tuscan lunch, at a family-owned restaurant, of authentic dishes passed down through generations. After lunch, stopover in Pienza, considered to be the best preserved Renaissance town in Tuscany, and walk its picturesque streets, wandering through its many charming shops and famous Pienza cheese botteghe, before returning to your hotel.